Looking for a USED TUJ 630 MEF X 1500? Lathes machines TUJ-560/630 MEF with Fanuc Power 0i Mate-TC control system are intended to execute general turning operations for piece and lot production. Machine rigid construction, high power of driving motor and applied rolling screw for slides drive, ensures a great capacity and machining accuracy. Control system enables work in conventional way (using manual handwheel), or semi automatic with manual correction of cutting depth for each cut and automatic by recording machining cycle, setting a cutting depth and starting the cycle. Most of the elements used by operator during turning operations is spaced on a control desk slidable along the bed. Additional display of the control desk enables simple setting of all essential parameters like: spindle speed, rate of travel, programming and cycle selection. Operator can see on the display entered parameters and tool position therefore he can go on with machining operations. Spindle speed synchronization with slidable motor revolutions in axis Z allows executing a wide range of various threads. Possibility of operating CNC and manual mode. Tool selection and tool offset functions are available as well as constant cutting speed. There also exist a possibility of connecting an external personal computer by RS-232C interface. 19 ModelsView more about Fabryka Maszyn Tarnów Łukasz Świderski & Józef Świderski s.c. 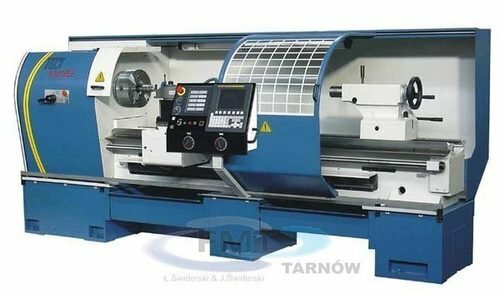 Looking to Purchase a New TARNOW TUJ 630 MEF X 1500?